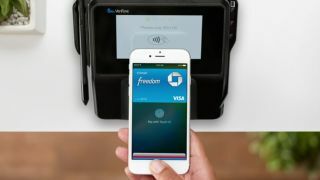 When Apple Pay launched last year, it was widely expected that an Australian launch would follow quickly, thanks to the prevalence of NFC-enabled payment options in retailers around the country. But fast forward to today and Apple Pay is nowhere to be seen, despite our advanced payments infrastructure. It turns out that like so many things, the sticking point isn't about tech, but about money. A new report in the AFR claims that Australia's big four banks are resisting the launch of Apple Pay in Australia due to an inability to agree to how much the Cupertino firm would make from each iTransaction. According to the AFR report, Apple currently earns about 15 cents for every $100 spent in the US, and that's a rate it wants to maintain here in Australia. The issue is that the US banks generally make about $1 of profit for every $100 spent, so sharing 15 cents isn't that big a deal. In Australia, banks only make about 50c per $100, so giving up 30 per cent of their profit to Apple is a sticking point. What makes things even more problematic is the fact that the Reserve Bank in Australia wants to drive down that 50 cents per $100 down to about 30 cents, which would further erode their profits. It's not all bad news though. The recent launch of Apple Pay in the UK reportedly saw British financial institutions drive down the arrangement with Apple to a few pence per £100, so there's precedent for Apple to negotiate. Out of Australia's banks, the AFR claims that NAB appears to be closest to signing a deal with Apple, although there's a good chance a smaller bank will sign off first and use the ability to pay with an iPhone 6 or Apple Watch as a marketing play.